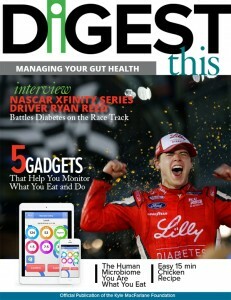 The Kyle MacFarlane Foundation, a 501 (c) (3) non-profit organization, launched Digest This! Magazine, a digital publication focused towards the education and research of digestive diseases, and how gut-health directly affects the mind and body. Digest This! contains a variety of lifestyle, nutrition, exercise, and reporting on the cutting-edge research linking food with mental, hormonal, and physical ailments. The launch of the publication was funded by donations and grants to offer a unique approach to the multitude of healthy lifestyle publications on the market, and to promote the foundation’s goal towards the education of digestive issues. The premiere issue can be viewed HERE, and features an interview with NASCAR Xfinity Series driver Ryan Reed. Diagnosed with Type-1 Diabetes, Reed tells Digest This! how he implements a healthy eating and exercise plan that helps him stay behind the wheel. The issue also has an article with fitness personality Rosalie Brown who discusses the importance of keeping your body in motion. Dr. Pankaj Jay Pasricha, M.B.B.S., MD discusses in his article, the latest research connecting gut health, and how it affects the mind and body. Former MasterChef TV competitor Katrina Kozar tells Digest This! her take on healthy cooking and shares some recipes. Emmy Award-winning TV producer Christina Deyo gives a first-person account on how television celebrity Martha Stewart, led hear on a path to a healthier lifestyle. Additional articles and recipes are also a part of this premiere issue that’s free and formatted for mobile and tablet viewing, allowing anyone access to the articles within its pages. The magazine is also available from the Foundation’s website, and the www.DigestThisMagazine.com website, as well as through social media and website pages from research medical partners to school districts and personalities involved in the foundation’s efforts, to reach more than one-million eyes for the publication’s launch. For more information, visit the foundation’s website, at www.thekylemacfarlanefoundation.org.